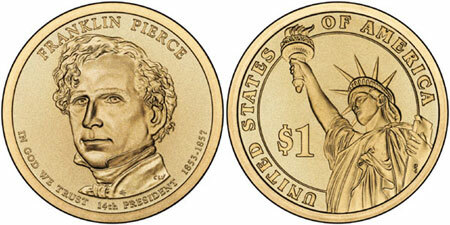 The Franklin Pierce Presidential Dollar will be the second release of 2010 for the Presidential $1 Coin series and the fourteenth for the series overall. The circulation release date has been tentatively set as May 20, 2010. Continuing the familiar format of the series, the obverse of the coin features a portrait of President Franklin Pierce. It was designed by Susan Gamble and sculpted by Charles Vickers. The obverse inscriptions include the name “Franklin Pierce”, the motto “In God We Trust”, “14th Presidency”, and the years of the Presidency “1853-1857″. The reveres of the series will feature the image of the Statue of Liberty designed and sculpted by Don Everhart. The image is meant to symbolize the concept of Liberty and has been used throughout the series. The reverse inscriptions read “United States of America” and the denomination expressed as “$1″. The edge of the coin featured incused lettering. This is where the date and mint mark appear, as well as the motto “E Pluribus Unum” and an arrangement of thirteen stars. Mintages for Presidential Dollars have shown a general decline since the series began in 2007. The series will be interesting to watch during 2010 to see if the trend continues, begins to flatten out, or reverses.